Delvis Savigne Friñòn was born in Santiago Cuba. He is a graduate of the Josè Marìa Heredia Academy of Art with a degree in Contemporary and Folkloric Cuban Dance. He gained the place of soloist with Danza Del Caribe and traveled to perform and teach in Jamaica and at the World Fair in Zaragoza Spain. He has danced with Kim Epifano, Dance Brigade, Arenas Dance Company, Nicole Klaymoon’s Embodiment Project. He currently dances with Robert Moses’ Kin. This is his fourth season with Alayo Dance Company. Adonis Damián Martín Quiñones was born in Contramaestere, a province of Santiago Cuba on June 17,1990. He is a graduate from José María Heredia Dance Academy entitled with a degree in Modern Dance. He is a soloist for the Teatro de la Danza del Caribe. He also performs with Locomotion, an audio-visual and interactive dance company. He dances with Kim Epifano, Krissy Keefer, Berkeley Ballet Theater. This is his fourth season with Alayo Dance Company. Timeline is an intimate and abstract movement study weaving choreography, spoken word and song to offer a visceral experience of a dancer's life through themes of love, fear, identity, discovery and loss. Daughter of Bernadette Chaves Nunes and Aluizio Ribeiro Bastos, started her performance career as a child with the Miami Ballet and later, with the Isadora Duncan Dance Ensemble in Miami, Florida as an “Is adorable”. After receiving her BFA in Dance from New World School of the Arts, she has been performing and teaching Modern and Contemporary Dance throughout the United States, Germany and Brazil, after losing her leg in a car accident. Winner of the 2011 San Francisco "Izzies” Award for Outstanding Achievement in Performance Ensemble with Ase West Dance Theater Collective, she has also worked with the Urban Bush Women, Axis Dance Company, Deep Waters Dance Theater, Aguas Da Bahia and Ron Brown’s/ EVIDENCE. Her teaching credits include FSU/World Dance Festival, American College Dance Festival, ODC in San Francisco and various schools and arts organizations throughout the Bay Area in California, including Destiny Arts Center and Youth In Arts/ VSA. Amor y Justicia is a project of SF 108 | Westside Performance Works - Ubungen’s current container for interdisciplinary projects. Amor y Justicia is inspired by Ms. Ubungen’s experience attending the entire Alex Nieto trial in March 2016 and her on-going advocacy and activist work relating to SFPD’s use of excessive force/wrongful deaths - including being on the first response team for unhoused witnesses of the Jose Luis Gòngora-Pat at Shotwell and 18th streets in San Francisco’s Mission district. Pearl is an award-winning interdisciplinary artist, cultural activist and community historian who began her dance and performance training with the late, great master artist Ed Mock. Ms. Ubungen’s influences include training in Ethnic Studies and History at SF State University, study and practice of the Nyingma and Kagyu lineages of Tibetan Buddhism, and embodied contemplative practices including the somatic method of Moshe Feldenkrais. Ms. Ubungen continues to evolve a practice of radical improvisation called, “diamante”. Sebastian Hernandez is an LA native and multi-disciplinary artist double majoring in Art Practice and Dance and Performance Studies at UC Berkeley. He makes art that ranges from drawings to paintings and performance art. Hernandez employs feminist theoretical analysis, queer theory, brownness and collectivity as modes of thinking and generating works that shift and complicate Mexican and Chicano narratives. His art making is influenced by an embedded connection to his Aztec heritage and the history of the brown body in relation to the U.S. and Mexico borderland. Sebastian's movement-based practice is informed by his long standing practice of Danza Azteca, vogue and the more recent wide range of modern dance techniques he has learned at Cal. 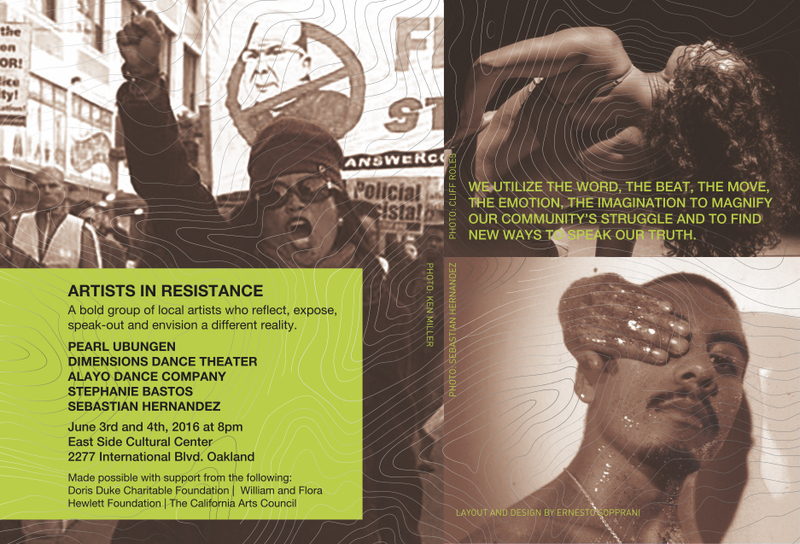 Dimensions Dance Theater is a contemporary dance company co-founded in Oakland, California in 1972 to promote public awareness of the central role that African Americans have played in defining American art, culture, and social change. The company is committed to producing, creating, performing, and teaching dance that reflects the historical experience, struggles, and contemporary lives of African Americans. 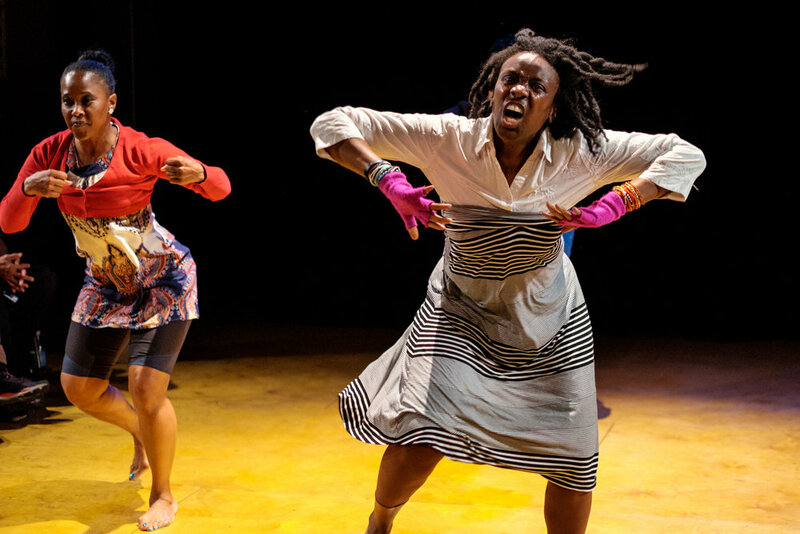 Under the continued artistic leadership of co-founder Deborah Vaughan, Dimensions Dance Theater presents traditional African dances, as well as original contemporary choreography drawn from African, Jazz, and Modern dance idioms. The company also does educational programming, principally through Rites of Passage, its highly acclaimed community based dance program for youth.